In 1915 the airplane division of Schütte-Lanz Luftfahrtzeugbau was organized on the outskirts of Mannheim and its first original development was a wooden prototype two-seater. So the first model from the company in 1915 was the reconnaissance scout biplane called the Schütte-Lanz C.I. (photo) It had a conventional configuration for a pusher, 7.70m wingspan for 5.20m long. As the designation suggested, it was armed, the observer being given a scarff-mounted light 7.92-mm Parabellum machine gun in the forward section of the nacelle. The latter was mounted relatively high on struts compared to the lower wing and wheeltrain. The pilot layed under the main upper wing and his visibility was reduced contrary to the observer. The small tail unit layed under the main ailerons. The C.I was powered by a Mercedes D.III engine rated for 160 hp. 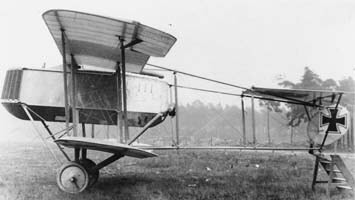 Tests showed some structural and stability problems which led to its rejevtion, but the C.I became the first step in a long serie of prototypes and small production planes. The Schütte-Lanz D.I was the first prototype fighter of the company. This model was developed in its plant in Zeesen in Brandenburg, created in 1915 as a replica of the British Sopwith Tabloid. It was notorious as the first German combat biplane, but underestimated and rejected by the Army at that time, still convinced only monoplanes were suitable as fighters, notably because of better visibility. A situation which was ironically the exact reverse of what happened with the RFC, which estimated monoplanes too dangerous and banned them. Planned further development of this sole prototype led to D.II powered by a stronger 100 HP Mercedes in-line engine. But it was tested and also rejected for production. By 1916, the D.III and D.IV were developed in parallel. The Schütte-Lanz D.III was a singular biplane with wings connected by V-struts of varying lenght like the Nieuport 11 sesquiplane and an aerodynamically refined cowling and nose to house the Mercedes D-III in-line engine. As a result, the D.III was quite fast for its time. Nevertheless, it was tested and rejected again because of poor flying characteristics. The Schütte-Lanz D.IV had a stronger 220 hp Benz-Bz-III engine but showed even weaker performances and only two prototypes were tested. The planned development of the D.V was delayed until the new supercharged Mercedes D III was available. Also in parralel, a single D.III was converted as a triplane, designated Schütte-Lanz Dr.I. It was also tested but rejected. At last in 1917 the Schütte-Lanz D.VI appareared with 160 hp Mercedes D-III engine as a mixed sesquiplane-monoplane parasol, which upper wing was supported by wide, wing-like struts. A single prototype was built in 1918, flying for the first time on May 29, 1918, but soon turned over and crahed, totally destroyed in the accident. The Schütte-Lanz D.VII returned to the D.III solution with the D.III Mercedes, and three prototypes were built, still in trials when the war ended. Schütte-Lanz G.I bomber after a rough landing. As you can see, the Schütte-models were prototypes. Despite making interesting proposals, these planes were all rejected for production, chiefly because of unsufficient flying characteristics. Mostly they were biplanes, but there was a single parasol model and a triplane. The number in bracket at the end is the estimated "production". Zeppelin is frequently thought to be Germany main and sometimes only airship manufacturer. In reality series of rigid airships were designed and built by other manufacturers, one of the most prolific and successful being the Luftschiffbau Schütte-Lanz from 1909 until the S.L.22 delivered in 1917. Research and passenger airships were also planned for post-war use.